Personality: Gamzee is a downright lazy person. He would rather befriend his enemies than fight them. However, this is just a mock-up for his hidden personality. Whenever he loses something he wants, or gets hurt to much, he begins to become insane. He turns into a cold-hearted masochist, who would rather see his own blood mixed with his enemy's. Class: Joker. The Joker class is a twin-personality class. On one side of the Joker, you see the playful-type man who would rather befriend his enemy rather than hurt them. On the black side, however, you see a raging masochist who gets off at seeing another person's blood drip to the ground. The Joker class has an unusually high speed rating, and an immense health bar (due to his masochist ways). This class is also able to wield any weapon as sort of a "Wild Card" (in keeping with how the Joker Card acts as a wild card). Spells/Abilities: His only ability is masterful speed and a rather high HP Bar. He can take tons of hits without being anywhere near close to dying. He also gains a rather strange ability when he enters Insane Mode - The ability to wield and master any weapon he comes across. He's also rather berserk with his attacks, but he knows how to control them. Additional Information: 5'8, 120 lbs. He likes to chill around and play with his enemies, rather than fight them. When he enters insane mode, the only thing he likes is to see the blood of his enemies fall to the ground. Biography: Gamzee was a young man at the time of Alternia's (His home planet) destruction. He saw the heartless take over and kill his family. 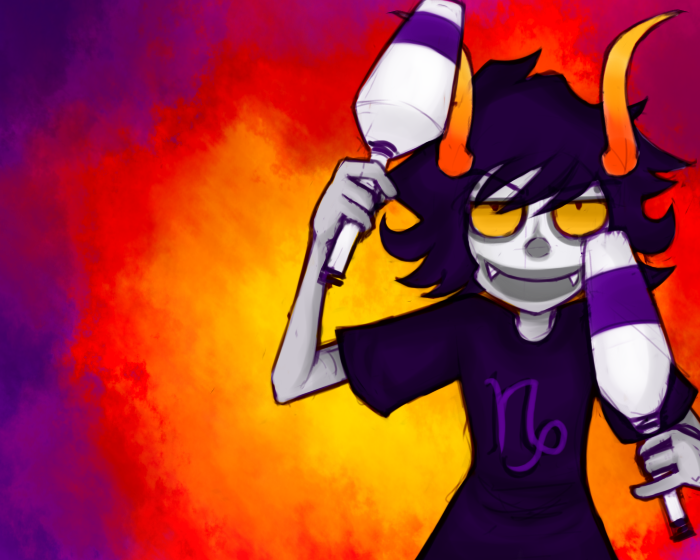 Angered by this, Gamzee picked up two juggling clubs from his circus job and began to defend his planet. He gathered more followers to help against the heartless, but soon he was the only one left. He went mentally insane at the fact that his entire race has been destroyed. He began to feel like he wanted to feel more pain, so that he can return the pain to the heartless. He also gained a sense of superiority. He wanted to make other races feel the same way as him. However, he knew that this would lead to trouble. After escaping Alternia on a gummi ship, his personality began to shift, changing from cheerful and polite to murderous and insane, like a black and white mask on a joker. He crash landed on Disney Castle, further increasing the split between his personalities, so much as to make them seem like two different people entirely. His main goal was to destroy the heartless, and help anyone who would also see his goal. However, if he begins to see his own blood drop on the ground, or begins to find his comrades being hurt, his personality will shift into Insane-Mod, in which he won't be able to differentiate between enemy and ally.